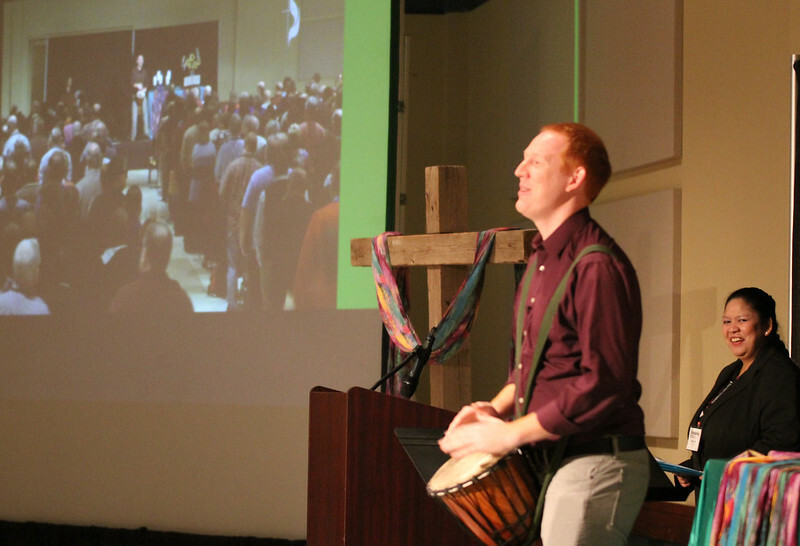 Thinking outside the proverbial box to attract new and younger disciples of Jesus Christ was an overriding theme of this year’s Orders & Fellowship gathering, Jan. 18-19 at the Bicentennial Center in Salina, Kansas. More than 600 clergy from across the Great Plains heard ideas for entrepreneurial ministry from the Rev. Dr. Kenda Creasy Dean and what young people want in worship from the Rev. Dr. Stephen Cady. Young people discontented with their church is nothing new, said Dean, professor of youth, church and culture at Princeton Theological Seminary. It’s what prompted a 33-year-old Martin Luther, whom Dean dubbed a “medieval tech nerd,” to print and distribute his thoughts that led to the Protestant Reformation. She encouraged modern-day pastors to “flip the church on its head a little bit” in ways to accomplish their ministries. That includes, she said, flipping the script to where youth ministry leads the way and is the “research and development arm” of the church. In one of many illustrations of successes from across the country, Dean pointed to a youth ministry that began from an associate pastor on the East Coast. After a cut in pay, he began working for a fisherman to earn extra money. Youth in the church began to fish with him, and eventually the church paid him to fish – as well as mentor and guide the young people in both spiritual and rod-and-reel techniques. “Loves makes us inventors,” Dean said. Mowtown, a teen lawn care service in Washington state that feeds the spiritual lives of youths as well as gives them a work ethic and a sense of ownership in the business. A church that opened its own Subway franchise in its building to help young people gain job experience. Try Pie, an Iowa youth development program in which half the time is spent in devotion and the other in making pies that are sold at area events. Pres House, a campus ministry at the University of Wisconsin where enough money was raised through service projects to build a new dormitory on campus. A church-sponsored food truck that comes to area events, filling spiritual needs as well as menu orders. The last time many people in the former Kansas East Conference saw Stephen Cady, he was wearing his trademark Superman T-shirt and carrying a yo-yo. Cady brought with him the results of his doctoral thesis, primarily asking young people what bores them about church and if they feel like they’ve experienced God in the worship settings. “Parents and leaders know how miserable their young people are,” Cady said. One-hundred percent of the young people surveyed, Cady said, dread the sermon the most in the worship setting. Secondly, he said, young people don’t feel like they have a connection with other church members or clergy, with the exception of the youth minister. The Burning Man Festival, a gathering of young people that has developed into its own culture with a Bohemian spirit of togetherness and teamwork. Improv Everywhere, a comedy group that pulls non-offensive pranks, including (shown in videos at Orders & Fellowship) an impromptu wedding reception for a couple getting married at the city hall in New York and a Little League baseball game that was supplemented with dozens of fans, cheerleaders and major-league quality TV coverage. Cady, a native of Olathe, Kansas, will return to expand on his findings at the Great Plains Annual Conference session June 7-10 in Grand Island, Nebraska. Eight workshops offered during Orders & Fellowship included “How Your Church Can Turn a Hare-Brained Idea into a Sustainable Ministry” and a question-and-answer session with Dean; “Generational IQ,” led by the Rev. Nicole Conard, coordinator of young leadership development for the Great Plains Conference; Mentor Training, conducted by representatives of the Board of Ordained Ministry; “Searching for Unicorns,” on finding youth ministry staff, by Shane Hinderliter, youth ministry coordinator for the conference; basics of live streaming and social media, by the Rev. Bill Gepford and the Rev. Melissa Gepford, from Tonganoxie UMC in Kansas; and “The Church’s Song,” led by Brian Hehn, Dallas, director of the Center for Congregational Song.